"This recipe is from my Grandmother in Tennessee. She made it for my family every visit, for 25 years. I make it for my family now, it lasts maybe two days." In a medium bowl, stir together the gelatin mix and cake mix. Add the eggs, oil, water and vanilla, mix on high speed of an electric mixer for 3 minutes. Pour the batter into the prepared pan. Bake for 35 to 40 minutes in the preheated oven, until cake springs back when lightly touched. Be careful not to overbake. I use a recipe similar to this, except I use Yellow cake mix w/ pudding in the mix. And I use 1 C Tropicana Orange Juice with lotsa pulp. Everyone loves it! You can't go wrong with this recipe. I've made this several times. Used an oblong pan and iced it with orange cheese cheese frosting because of everyone's sweet tooth. It did great. Will make it again and again. What a wonderful cake! I changed a few things...1c. oil, 1c. orange juice and orange extract. Super moist, wonderful texture and oh so good! Yummy!!! I did make a few changes. 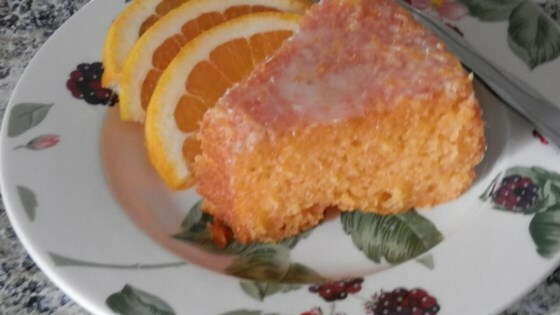 I used orange cake mix along with adding 1/2 cup of oj/tangerine juice and a few tablespoons of triple sec. Loved the orange flavor of the cake! !